We read with interest the article by Tu et al (1) in the April 1998 issue of the AJNR regarding the buccal space as a safe route for the performance of biopsy within the parapharyngeal region. In the article, the authors mention that CT guidance for biopsy of other deep-seated infratemporal masses, including the parotid space, has been reported. Nonetheless, the studies that were referenced with respect to such CT-guided biopsies (2, 3) appear to describe CT-guided parotid lesion biopsy only via a direct transparotid approach. 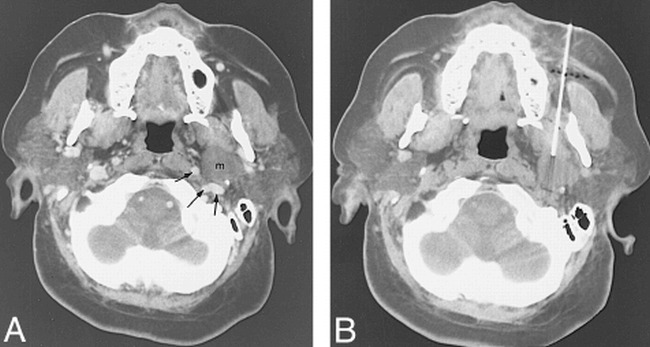 In a related study (4), CT was not used to guide parotid lesion aspiration. A patient was referred to us recently from an ENT clinic for biopsy of a deep parotid mass. This 43-year-old woman had undergone MR imaging for what was ultimately diagnosed as corticosteroid-dependent optic neuropathy. That MR study showed an incidental 2.5-cm mass in the region of the deep portion of the left parotid gland. Using a coaxial technique, we obtained biopsies of this lesion via the buccal space with CT guidance (Fig) without complication. Although we could have acquired a biopsy of the mass from a lateral approach via a transparotid route, we decided to obtain a tissue sample via the transbuccal space to eliminate the possibility of injuring intraparotid branches of the facial nerve and avoid damaging the nearby carotid sheath vasculature that such a transparotid approach could entail. We agree that the transbuccal space route for aspiration/biopsy of deep infratemporal fossa masses should not only be a relatively safe route for evaluating masses arising in the parapharyngeal region, but also for evaluating masses in the deeper portion of the parotid space and in the parapharyngeal fat space. In some cases, deep masticator space and possibly anterior carotid space lesions may also be amenable to such evaluation though we have not performed any such biopsies. All such lesions, however, initially should be evaluated with dynamic contrast-enhanced CT scanning to localize major vascular structures definitively and determine the safest route for biopsy that may or may not be through the buccal space. Surveillance CT scanning during needle placement is also necessary to monitor needle position and confirm ultimate intralesional needle placement.